While there is no explicit mention of Easter in the Sherlock Holmes story, we do have a story arc that follows the Easter mystery. While Holmes himself may not have been terribly religious (although he did express some acknowledgement of a higher power from time to time), he respected the tradition and the necessary belief in resurrection. 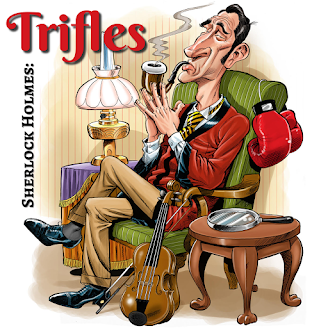 Narrator: [00:00:01] Welcome to Trifles, a weekly podcast about the Sherlock Holmes stories. Narrator: [00:00:11] Yes the problem was final the house was empty and his bow was last, but there were so many other details to pick apart in the stories. Narrator: [00:00:22] You know the plots but what about the minutiae? Why would the Pope engage Sherlock Holmes's services. Why did he receive the Legion of Honor from France? And why would he refuse a knighthood? Denis Quilley: [00:00:33] You are very inquisitive, Mr. Holmes. Jeremy Brett: [00:00:35] Is this my business to know what other people don't know. [00:00:38] Scott Monty and Burt Wolder will have the answers to these questions and more in Trifles. Narrator: [00:00:48] Episode 15: Sherlock Holmes and Easter. Scott Monty: [00:00:56] Welcome back to Trifles, the Sherlock Holmes podcast where we talk about the details in the Sherlock Holmes stories. I'm Scott Monty. Burt Wolder: [00:01:05] And I'm Burt Wolder. Scott Monty: [00:01:06] And have you got your Easter bonnet ready, Burt? Burt Wolder: [00:01:09] Oh I do. I do. With all the frills upon it. Scott Monty: [00:01:16] [Laughter] I don't know the rest of the song, so that's as far as I can go. Burt Wolder: [00:01:19] You'll be the grandest lady in Easter Parade. Scott Monty: [00:01:23] Look it's you. Burt Wolder: [00:01:25] I'll be all in clover when they look you over. And it's got that wonderful rhyming lyric in there from Irving Berlin about rotogravure. Scott Monty: [00:01:36] I love that. Is that from Easter Parade? Burt Wolder: [00:01:43] Well yes I think it's one I think I think. Scott Monty: [00:01:46] Fred Astaire, Judy Garland. Burt Wolder: [00:01:47] Yeah. Well my memories grows sketchier - I'm about to say that I think Berlin you repurposed that tune from the prior show. But yes certainly features in Easter Parade. Burt Wolder: [00:02:01] And elsewhere, yeah. Scott Monty: [00:02:05] They don't -- Oh here it is. Yeah. I'll be the proudest fellow in the parade. On the Avenue, Fifth Avenue, the photographers will snap us. Burt Wolder: [00:02:15] And you'll find that you're in the rotogravure. Scott Monty: [00:02:21] Oh I could write a sonnet about your Easter bonnet and of the girl I'm taking to the Easter Easter Parade. How about that? A little little Hollywood musical trivia here for you for the Easter season. Well again, if you are just joining us please leave us a rating or review on the platform of your choice wherever you happen to listen to us. Comment for this show are available at ihose.co/trifles15 - we'll have all the show notes there and the transcript of the show as well. And we do need funds to help with getting the transcripts done. So if you wouldn't be averse, head on over to SherlockHolmesPodcast.com and hit that orange Patreon on button to help support the show in any way you feel possible. Scott Monty: [00:03:18] So we wanted to talk about the holiday. You know whenever the holidays come around we have a show that's dropping we try to tie it into those various there's various instances and in this case we have the Western Christian holiday of Easter, which this year happens on April the 16th. We're on the 12th at the 16th just coming up. And we wanted to talk about canonical references to Easter and it'll will be a short show. There were none. Burt Wolder: [00:04:00] The game's afoot. Scott Monty: [00:04:03] However, we found an article in Crisis Magazine which is a Catholic publication and it's titled "He is Risen: Sherlock Holmes and the Mystery of Easter." And we wanted to break it down a little bit. The article begins with "Eastertide 1894 marked the resurrection of a famous figure Besides Jesus Christ. Sherlock Holmes, supposed dead for three years following his agony with the Napoleon of crime, reappeared suddenly to his friends in London heralded not by an empty tomb but an empty house." The Adventure of the Empty House, where Sherlock Holmes finally made his reappearance after having experienced some time in the Strand Magazine in a retrospective fashion and the Hound of the Baskervilles which was serialized in 1901. So there are very few literary giants that can complete this kind of resurrection -- at least human ones. And Sherlock Holmes, the article says, "is the most recognizable and renowned protagonist of all time." And they also claim he's "a true and tremendous Easter icon as one who exemplifies the Christian paradigms of conquering the powers of evil through truth and resurrection. Scott Monty: [00:05:34] So let's pause there for a moment. Well you know we're not trying to get all religious here but just drawing elements of the religion and comparing them with what Conan Doyle is given us. Now what do we know about Conan Doyle upbringing, Burt? Burt Wolder: [00:05:51] Well he went to to a Jesuit school and that was a formative experience for him because it shaped his personal faith and his view of the world. And he found it impossible to reconcile all the teachings that he was confronted with which communicated to him that those outside the church were forever damned - at least that's how he reported it - with his personal experience and sense of God and sense of faith. He felt that this was inconceivable and therefore -- you know, and it's a mark of his attitude and confidence and a person force of his own personal the work force of some personality that he simply rejected it. Not the God I know not the characteristic of the loving world with which I'm surrounded." Scott Monty: [00:06:51] And in the most recent episode of I hear of Sherlock everywhere of course we interviewed Michael Sims the author of Arthur and Sherlock and that book actually goes into some pretty heavy detail about. CONAN Doyle's perspective on this. So if you haven't had a chance to pick up a copy of Arthur and Sherlock and you're interested in learning about some of the formative years of Conan Doyle how he got to be where he where he ended up - we can't recommend this book highly enough by Michael Sims: Arthur and Sherlock. Scott Monty: [00:07:29] So we've got Conan Doyle who as we know later in life just completely discarded with his Catholic upbringing and may have already at this point in his writing career. Certainly we're into the early 1900s at this point. And I believe his first wife would have passed on right around this time 1907 or so was that right? Scott Monty: [00:07:58] I think it was around that time. Burt Wolder: [00:08:01] Yeah. Well I think so. I'm bad on that and that particular chronology. Scott Monty: [00:08:08] And it wasn't too long before he was embracing spiritualism so. Burt Wolder: [00:08:13] Well that really picked up steam you know after World War One. Scott Monty: [00:08:19] Yeah certainly with the death of his son and whatnot. But it's interesting even though even though Christianity and certainly Easter and the resurrection are not mentioned head on in the canon, I really have to wonder how much of these formative years and this this Jesuit education was simply in Conan Doyle subconscious and was expressed in various ways. Now, we can go back and interpret all of this stuff and apply the lens that we want to it. But it must have had some kind of formative capacity in what he was writing. Scott Monty: [00:09:09] Well I expect so you know it pops up from time to time in different places. Burt Wolder: [00:09:14] I think we've talked about this before in "The Naval Treaty," you know there's this remarkable scene where Holmes has now acquired a lot of the facts he's been on site and gotten a sense of what the case is and then that's a complete non-sequitur. He he moves to the window and just in the middle of a complete non-sequitur he says. 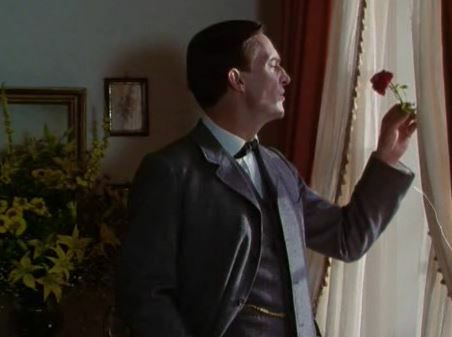 Jeremy Brett: [00:09:37] What a lovely thing a rose is." Jeremy Brett: [00:09:45] "There is nothing in which deduction is so necessary as in religion. It can be built up as an exact science by the reasoner. But our highest assurance of the goodness of Providence seems to me to rest in the flowers. It is only goodness which gives extras. And so I say again, we have much to hope for from the flowers. Burt Wolder: [00:10:19] And that's unique I think in the canon and it's the clearest statement I think we have from Holmes. And then we can infer from Conan Doyle about his own personal faith and the way he viewed the universe. Jeremy Brett: [00:11:58] "What is the meaning of it, Watson? What is the object of this circle of misery and violence and fear? It must have a purpose. Or our universe has no meaning and that is unthinkable." Burt Wolder: [00:12:16] Mmm, yeah. That's true. Well you know also there's there's a good deal of precedent - I mean obviously Jesus - but a good deal of precedent and recurrence in resurrection and reappearance of characters. For example a scene that -- my Shakespeare thinking is a little bit faulty -- but I remember that Falstaff dies. There's this in Henry V, there's a line something like "Falstaff is dead and we must yearn therefore." And so Shakespeare polishes off Falstaff but he comes back and a lot of the legend is that it was at the command of Elisabeth I who liked the character and so he sort of reappears and the Merry Wives of Windsor. And then of course after Sherlock Holmes you have James Bond. I mean there's a point in You Only Live Twice where there's an obituary for old James Bond believed killed on an official mission to Japan. And his survival must now be abandoned. And you know that doesn't hold up either. Scott Monty: [00:13:31] Yeah. It's a good point. Burt Wolder: [00:13:35] And then there's Poirot. You know when Agatha Christie ended the Poirot sequence with that last book whose name a name of which...now wait a minute. Was it the last book? Somewhere in the Poirot series where Hastings writes very clearly that Poirot is dead and it turns out that Poirot is not really dead. Scott Monty: [00:13:56] Well, what a relief. [Laughter] Well of course we all know that of course Holmes is a hero -- a hero of people. Christ in many ways kind of served a similar role -- a hero-type role. And we know that Easter is important in the Christian religion because it's the basis of the religion. This notion of dying to save others and Easter being the dawn of truth and a beginning. And when people comprehend a mystery they often say that knowledge dawns on them as the mind is drawn out of darkness and into light. And the article from Crisis magazine goes on to say, "The art of knowing the truth, which is the whole art of detection, unites the dawning of knowledge and the wisdom in the dawn of the resurrection, connecting the fullness of light and life to the illumination of mind and soul. Both the reality and mystery of Easter are central to any true vision and virtue and Sherlock Holmes participates in both as he tracks down the agents of darkness tirelessly like a bloodhound with a dedication and devotion emphasized by his miraculous return -- his resurrection from death to new life where the violin hums over the din of hansom cabs, tobacco smoke curls above the littered mantel piece, a pistol lies in every pocket and it is always 1895. He has risen indeed!" And we're lucky to have him. Now did you ever read Samuel Rosenberg's Naked Is the Best Disguise? Burt Wolder: [00:15:57] I have it on my shelf. The answer is no. Scott Monty: [00:16:02] The best place for it to remain, right? Burt Wolder: [00:16:04] I have never read it. Scott Monty: [00:16:06] You're one of the lucky few. Well this was a this was a book that came out in... was at the 70s? I have it here -- yes, '74. It kind of at that height of Sherlock-mania. The Seven Percent Solution was out around this time. Well, there's a whole section in this book from pages 186 to 196 that calls all sorts of specifics in the canon as irrefutable evidence that this was a resurrection story. Using references from the New Testament and then comparing them to instances in "The Empty House" and "The Final Problem." Here's one - this is a stretch: The New Testament - Jesus, the son of the Lord was murdered by Roman soldiers. And in "The Empty House" it begins with the murder of the Honorable Robert there who was killed by a colonel. Right? A soldier. And oh. While he may not have been a Roman soldier he was Colonel Sebastian Moran the son of Augustus Moran - you get the tie-in to the Romans there? This is how Ruth Rosenberg goes on drawing his "conclusions." Very tenuous. And you know, you can. Burt Wolder: [00:17:47] No offense to ROSENBERG, but you know that's the kind of thing that gets us you know the pyramids were built by aliens. Scott Monty: [00:17:54] They weren't? The next thing you know you're going to tell me they're not used for grain storage. Burt Wolder: [00:18:02] I keep telling people that the ATM wasn't put there by the Egyptians, that it came a lot later. It's not proof you know that people with credit cards actually built these. Scott Monty: [00:18:16] But you know I mean you can take any reference like that and try and extrapolate. I think the the broader strokes that Crisis Magazine took and looking at the overall purpose of Holmes and the way he stood up for things that that makes a lot more sense to me with regard to this Easter mystery. Clive Merrison: [00:18:33] It is of course a trifle, but there is nothing so important as trifles. Scott Monty: [00:18:37] Please join us again next week for another installment of Trifles. Show notes are available on SherlockHolmesPodcast.com. Be sure to subscribe to us on iTunes and be sure to check out our longer show I Hear of Sherlock everywhere where we interview notable Sherlockians, share news, and go into even more depth on certain topics. Peter Barksworth: [00:19:01] You take my breath away, Mr. Holmes. Jeremy Brett: [00:19:05] What do you make of this Watson? Edward Hardwicke: [00:19:07] It's an amazing coincidence. Jeremy Brett: [00:19:08] The odds are enormously against it being a coincidence!